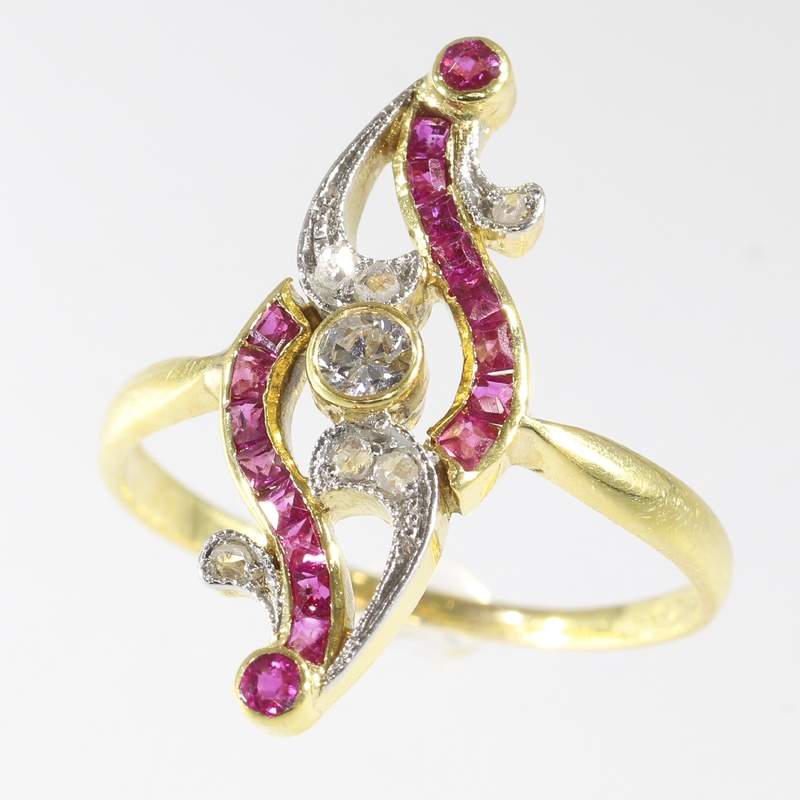 Elegant Belle Epoque ruby and diamond ring: Description by Adin Antique Jewelry. A Belle Epoque gold and platinum undulating navette shaped ring with central old European cut diamond and serpentine diagonal shoulders set with a row of carre cut rubies topped by a brilliant cut ruby each interlinked by two diamond covered decimals. Style specifics: The Belle Époque (French for "Beautiful Era") was a period in European social history that began during the late 19th century from the Franco-Prussian War (1870-1871) and lasted until World War I (1914-18). Occurring during the time of the French Third Republic and the German Empire, the "Belle Époque" was named in retrospect, when it began to be considered a "golden age" the major powers of Europe, new technologies improved lives and the commercial arts adapted Renaissance and eighteenth-century styles to modern forms. In the newly rich United States, emerging from the Panic of 1873, the comparable epoch was dubbed the Gilded Age. In the United Kingdom, this epoch overlaps the end of what is called the Victorian Era there and the period named the Edwardian Era. In the Belle Époque cheap coal and cheap labour contributed to the cult of the orchid and made possible the perfection of fruits grown under glass, as the apparatus of state dinners extended to the upper classes; champagne was perfected during the Belle Époque. Exotic feathers and furs were more prominently featured in fashion than ever before, as haute couture was invented in Paris, the centre of the Belle Époque, where fashion began to move in a yearly cycle; in Paris restaurants such as Maxim's achieved a new splendour and cachet as places for the rich to parade, and the Opéra Garnier devoted enormous spaces to staircases as similar show places. After mid-century, railways linked all the major cities of Europe to spa towns like Biarritz and Deauville; their carriages were rigorously divided into first-class and second-class, but the super-rich now began to commission private railway coaches, as exclusivity was a hallmark of opulent luxury. Bohemian lifestyles gained a different glamour, pursued in the cabarets of Montmartre. Diamonds: One old European cut diamond with an estimated weight of approx. 0.10 crt. and six rose cut diamonds . We do not have the weight of the diamonds which is normal in our trade when it comes to rose cuts. Precious stones: Ten rubies (eight carre cut and two brilliant cut). We did not check if the rubies are lab produced or not as this information has no influence on the value of this jewel. Natural rubies and lab produced rubies were both used in this era, rather more for their effect than for their intrinsic value. Birthstones: Diamond is the birthstone (or month stone) for April and ruby for July.